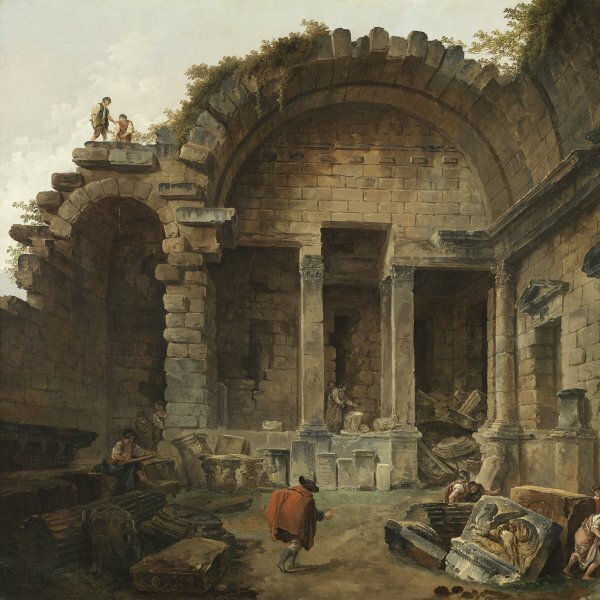 Hubert Robert's Civil Guard is an exceptional and most unusual work by an artist better known for his landscapes of Italy or the French countryside. When Robert arrived in Italy at the end of November, 1754 to study at the Accademia di Francia in Rome, he was described as "a young artist interested in architecture", and initially his fascination with the monuments of ancient and modern Rome developed there under the tutelage of Giovanni Paolo Pannini (1692/93-1765) and Giovanni Battista Piranesi (1720-1778). Robert first came to the attention of art collectors and critics with his paintings and drawings of the celebrated monuments he found in Rome, often uprooted from their actual settings and combined together in wholly imaginary, or capricious, compositions. When Robert returned to France late in the summer of 1765, after having lived and worked in Rome for eleven years, views of French architecture and the artist's native countryside became increasingly important in his work. One of the earliest instances of this concern is a red chalk drawing of the cloister in a French Gothic monastery, dated 1765, which is in fact not a view of an actual monument, but an invention by the artist of a building in the Gothic style. From this point onward the landscape and architecture of France, and particularly of Paris, occurs occasionally as the subject of Robert's paintings and drawings, and he was attracted from time to time by late Gothic or Renaissance French architecture. However, the artist very rarely represented figures in historicising costumes, as he did in this work. The three men here are attired in garments characteristic of the 1630s: at the left the figure wears a yellow coat with slashed sleeves, a wide lace-edged collar, a red sash knotted at the back, and a dashing plumed hat. The pair of men at the right each wear more sober versions of this costume, which appears to be modelled quite accurately on representations of dress worn in the Netherlands, Britain and France during the 1630s, although it has not been possible to identify the source that Robert must have copied. It also remains a puzzle why Robert was attracted to this historical epoch, which in France corresponds roughly with the regency of Maria de Medici, which she assumed until the infant King Louis XIII (1601-1643) could ascend to the monarchy in 1610. In France, this was a time of conflicts with Austria and Spain, and there is no obvious reason why Robert would have been attracted to the period. 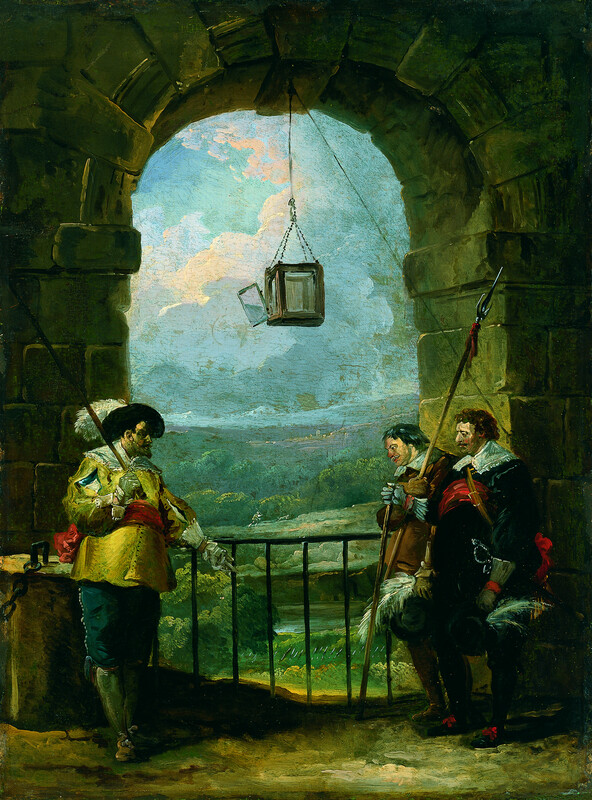 As to the subject of the Carmen Thyssen-Bornemisza painting, its alternative title The Arrival of the Emissaries, more accurately describes the facial expressions and gestures of the three men. The richly attired figure at the left stands haughtily erect with a scowl on his face, his left arm pointing down to some troops passing below, (only the tips of their staffs are visible) while the pair of men at the right stand abjectly, the figure in the brown coat wringing his hands imploringly. It appears that a military disaster of major consequence has occurred, and this tragic event contrasts vividly with the background vignette framed by the stone arch of a distant bucolic landscape. A decrepit lantern hangs from the centre of the arch as if to reinforce the sense of an event that has gone amiss, while at the same time it draws the viewer's attention to the minute figures of a hunter and his dog striding off into the forest. It is tempting to speculate that in Civil Guard Robert devised an allegory of the miseries of war and the benefits of a peaceful existence, although in his art he seldom makes references to a particular political or philosophic point of view. Because Civil Guard is undated, and is such an unusual theme in Robert's art, it is difficult to place in his oeuvre, but François Pupil's suggestion that the painting was executed c. 1780-1785 is convincing. About this time in France painters, especially of genre subjects, often incorporated references to 17th-century Northern art into their work.